Ron Diorio, having worked in the construction product industry since 1966, started in the home building business in 1979. In early 1983, R.L. 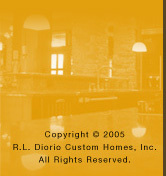 Diorio Custom Homes, Inc. was founded. R.L. Diorio is an Ohio corporation doing business primarily in the southern suburbs of Dayton. R.L. Diorio is a family owned and operated business that specializes in custom luxury homes and also builds many homes for the empty nester market.